Today this course is available for only £167! We are so pleased that you have chosen to up skill your knowledge and learn Fitness Pilates In Pregnancy and take your teaching to this advanced level with us. We will look at pregnancy in relation to the physical, physiological and emotional impact. Why specifically Fitness Pilates is a good choice for pregnancy, the steps to take with participants before commencing a workout, signs to look for during exercise and generic guidelines that should be strictly followed throughout the journey. This will help you support your clients in class and help them get in the best possible health & shape ready to fall pregnant. Finishing off with what to expect in each trimester, together with a corresponding workout plans, we have also included a session plan for the final last 2 weeks of pregnancy which covers breathing, pelvic floor exercises, mindset and meditation to enable you to be able to teach your pre-natal client right up to giving birth. However, it is vital that you understand that as a Fitness Pilates instructor, no matter what level of training you have had, you will be required to work alongside your participant’s health care professionals and gain knowledge from their information. Always make sure that clients have been cleared to exercise with you and offer 1-2-1 or small group sessions with pre-natal clients rather than to participate in your mainstream, large classes. 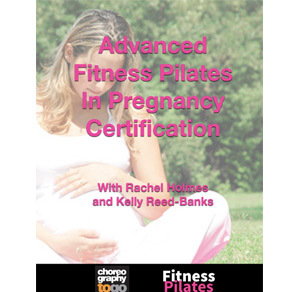 Fully in depth training manual including extra information on pre-conception, physiological changes in the body and Fitness Pilates workouts for each trimester. Online learning portal which includes videos on Functional Movement & pelvic floor engagement through movement techniques as well as ‘Do’s and Don’ts. Fitness Pilates exercises for each phase of the pregnancy. Nutrition, mindset, meditation & Fitness Pilates exercises for pre-conception as well as the last 2 weeks of pregnancy. Detailed consultation with par-q & lifestyle questionnaire. A session plan for just 1 class for their 1st, 2nd and 3rd Trimester. Evaluation of all 3 sessions on why you have chosen the exercises you have and how your client got on, including any changes you had to make to their session. We have a template you can use for your session plans or you can create your own, however we cannot supply you with an example health questionnaire as this is part of your assessment.